Compiled printed and published by Andrew Bent. 36 p., 10.7 x 18.2 cm. (varies slightly due to trimming). All surviving copies have been bound and no trace of any original covers remains. The first work of general literature printed in Australia. In July Bent announced he had printed more copies and these were only 2/6. This may explain the china paper used for the other three extant copies. On the basis of a very limited comparison of a few portions of text, they appear to be typographically identical with the Abbotsford copy, although Bent would have had to completely reset the type, having such a limited supply. It is just possible they were all printed together and the laid paper copies sold first. Some copies were sold in Sydney, and also by John Pascoe Fawkner at Launceston. The work has serious literary limitations, but is of great bibliographical significance. It was much noticed in England, with a copy probably there by the end of 1819. In May 1820 it was reviewed in the prestigious Quarterly Review. This article incorporated a long and favourable description of VDL written by Justice Baron Field of Sydney, who had been in Hobart Town while the book was still in the press. The review article did much to promote the colony as a destination for free emigration. There is evidence that this exercise was masterminded by Edward Lord, who returned to England in 1819, and was probably also involved in the publication shortly afterwards of a glowing account of VDL written by his friend Lieutenant Charles Jeffreys. The work was published anonymously and throughout the nineteenth century there seems to have been general acceptance that it was Bent’s work. 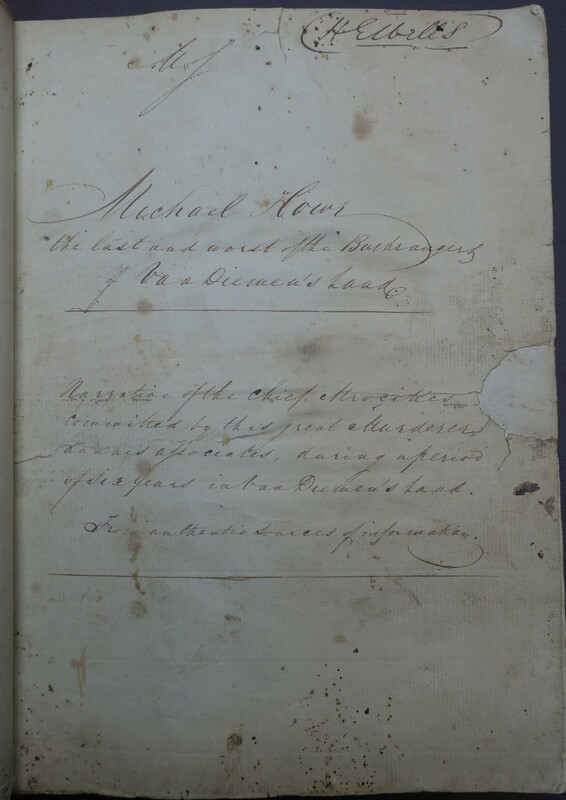 A contemporaneous manuscript version of the work (on same paper as the Abbotsford copy of the pamphlet and with some minor variations from Bent’s printing) survived in the family of Thomas Wells who in 1819 was, while still a convict, chief clerk to Governor Sorell. The manuscript came to public attention in 1925 and was published by Angus and Robertson the following year. In assuming that Wells must have been the author the printed edition gave some incorrect and garbled information about him and what his name was, and a rather false impression of what was actually in and on the manuscript. Cataloguers and commentators have ever since generally attributed the authorship to Wells without question. The Angus and Robertson version was twice reprinted in the Australian Historical Monographs series, and Wells’ authorship given the stamp of scholarly authority in an accompanying essay by George Mackaness. Librarian Janet Hine, who seems to have been the only person to critically examine the manuscript, concluded that while the handwriting is definitely that of Wells it is impossible to tell if he was the author of the story or simply copied it out. Noting the death of Howe in a colonial chronology in his 1829 Almanack, Bent gave his own unambiguous account. 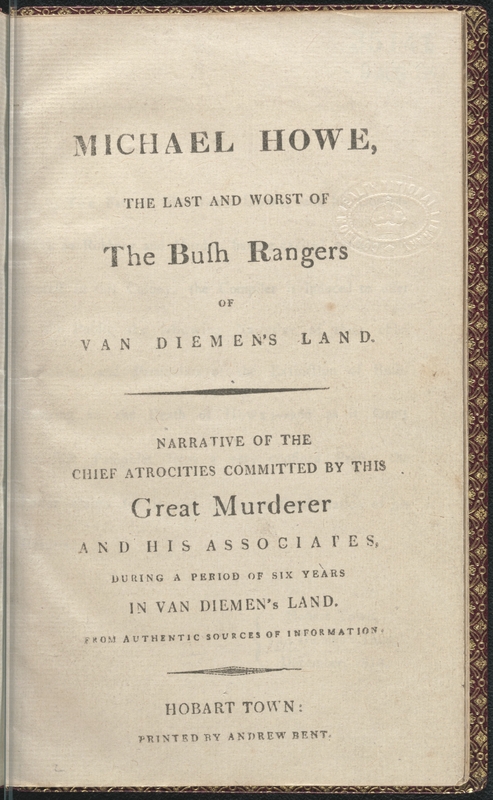 As no occurrence had ever excited more local interest, a small pamphlet giving a brief account of the atrocities of himself and his companions in guilt was shortly afterwards compiled, printed and published by Mr. A. Bent. The exact purpose of the Wells copy is not clear. Sir Walter Scott Library, Abbotsford, Scotland: Sent by Governor Macquarie 21 Nov. 1821, in response to Scott’s specific request. Probably one of the two copies sent to Macquarie by Sorell on 31 Mar. 1819 and therefore from the first print run. Laid paper with watermark C WILMOTT 1814 (visible only in part) and portion of what is possibly a Britannia mark. T.p. inscribed by Macquarie. Bodleian Library, Oxford: Presented by Thomas Hobbes Scott in 1821. Scott had been in Hobart as secretary to Commissioner Bigge in 1820. China paper. BL: Bound with other early VDL imprints in a volume purchased at auction in 1897. Originally from the Library of Thomas Scott, surveyor, who arrived in VDL in 1820 and returned to Scotland in the 1830s. Volume has Scott’s Earlston bookplate no. 908. China paper. ANL: From the library of British collector of Robert Leicester Harmsworth (1870-1937) purchased at auction by Maggs Bros. 1944 and sold to Commonwealth National Library in 1945. Earlier provenance unknown although its fine red morocco binding by W. Pratt was probably done in England between 1860 and 1890. Laid paper end papers (watermark only partially visible) may be from an earlier binding. China paper. No copies are known to have survived in Australia. A copy recorded in the catalogue of the Royal Society of Tasmania library in 1856 has disappeared without trace. Known to be missing when Ferguson compiled v. 1 of the Bibliography. Another copy probably in the collection of R. C. Gunn ca. 1848 has also disappeared and was not in the library when it was catalogued by E. M. Miller in 1921. Copies from the second printing in July 1819, if indeed there was one, were on sale until 1824 when Bent planned, but did not publish, a reprint. A second edition was published early in 1829. A third edition was advertised as ‘in the press’ in 1837 but there is no evidence it ever appeared. Facsimile reprint of ANL copy published Hobart: Platypus Publications, 1966; of Bodleian copy published London: Folio Society, 1977. In 1824 the text was reprinted in Edward Curr, An Account of the Colony of Van Diemen’s Land: Principally Designed for the Use of Emigrants.